I have always loved the Fourth of July. Growing up in a military family, patriotism was definitely something that was instilled in me from an early age. And now as a military spouse, it absolutely continues. I am incredibly proud of my husband and father (and brothers-in-law, grandfathers, etc) who have served (some still serving) this amazing country! Military bases, especially overseas bases, really know how to celebrate the 4th. They go all out! Base-wide BBQs, food trucks, raffles, bouncy houses, climbing walls, combat vehicle tours, emergency vehicle rides, air shows....all leading up to a dazzling fireworks show set to blaring patriotic music. I love it all! This year, I decided to add a few new pieces to help deck out my house to show this patriotic pride. First, I made this yarn-wrapped flag wreath. 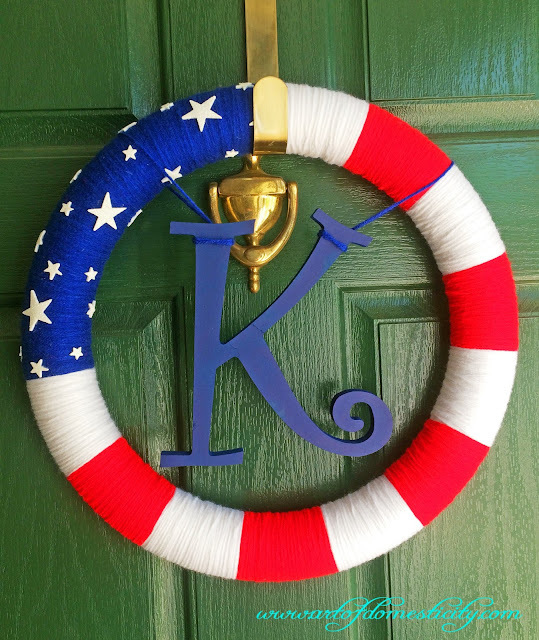 The second wreath I made was a large "K" flag, that I have hung up inside. I LOVE the way this one turned out!! 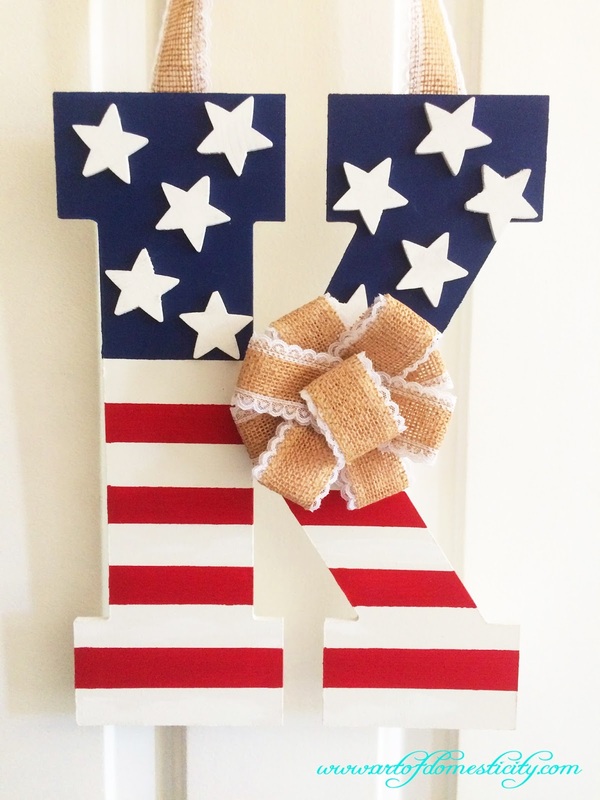 Supplies: large wooden letter (in our case, a "K"), masking or painters tape, white paint, red paint, blue paint, foam paint brush, wooden stars, burlap / lace ribbon, and a hot glue gun. I used the masking/painters tape to mark off the stripes. Then I painted all the red stripes and the blue top section. When that was dry, I removed the tape, and painted the white stripes. I also painted the wooden stars with the white paint. While everything was drying, I cut my ribbon into 4 equal length strips, and used hot glue to make four separate ribbon circles. I did one extra ribbon circle, but much smaller, to form the center loop. Once that was complete, I hot glued each circle together, one on top of the other, using the smallest loop as the top central loop. Then I hot glued it on to the wreath where the blue and the top white stripe meet. I used the same ribbon to hang the wreath by hot gluing a section on the back of each side. I LOVE how these both turned out. They add so much when you walk up to and into our home. So festive and fun!